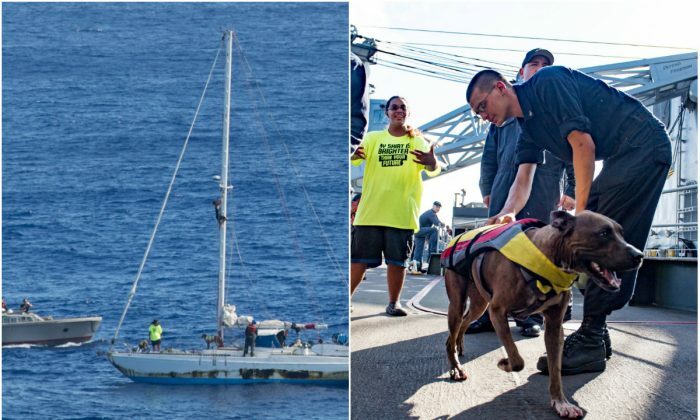 It was a truly joyous morning for Jennifer Appel, Tasha Fuiaba, and their two dogs when a U.S. Navy ship emerged over the horizon on Wednesday, Oct. 25. The four of them had been lost at sea for almost five months. 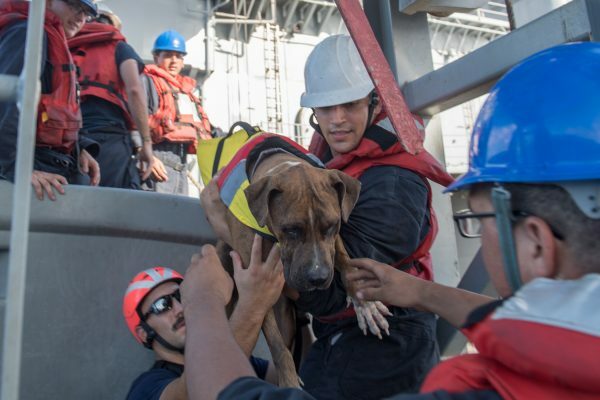 Unscathed, they were taken aboard of USS Ashland where they’ll remain until the ship’s next port of call. And they’ll have quite a story to tell. The two Honoluluans embarked on a trip to Tahiti back in Spring. But due to bad weather, their engine failed on May 30. They tried to reach Tahiti by sail, but got lost. About two months into their journey they started to send out daily distress calls. They were, however, too far out in the ocean for anybody to receive the signals. They had water purifiers on board and food to last them a year, like oats, pasta, and rice—that’s how they survived. Finally, on Oct. 24, a Taiwanese fishing vessel discovered them some 900 miles southeast of Japan. 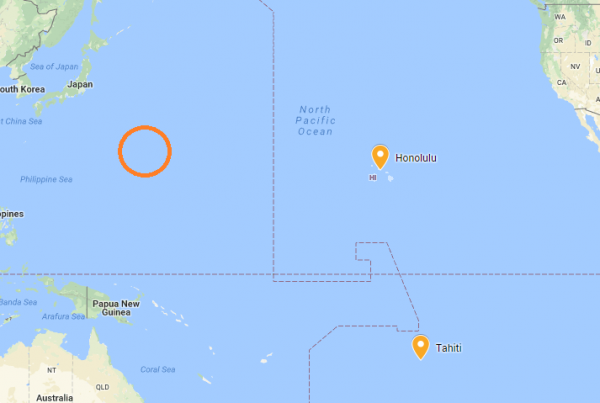 That means they ended up over 3,000 miles west of Hawaii, instead of 2,000 miles south, where Tahiti lies. 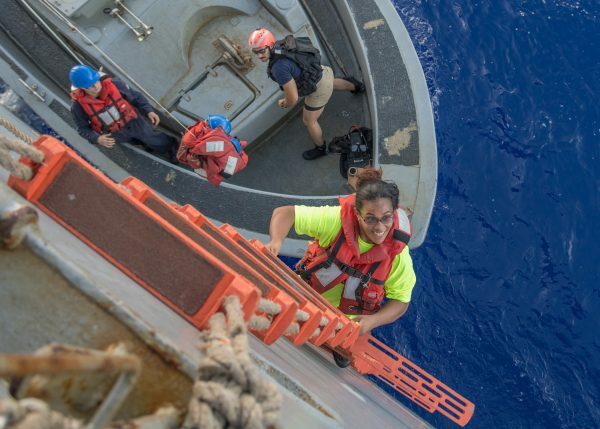 The fishing vessel contacted Coast Guard Sector Guam who then coordinated with Taipei Rescue Coordination Center, the Japan Coordination Center, and the Joint Coordination Center in Honolulu to mobilize a rescue. Needless to say, the mariners were happy to see the Navy. The dogs were barking and one of the women was blowing kisses to the Ashland as it approached around 10:30 a.m.
“I’m grateful for their service to our country. They saved our lives. 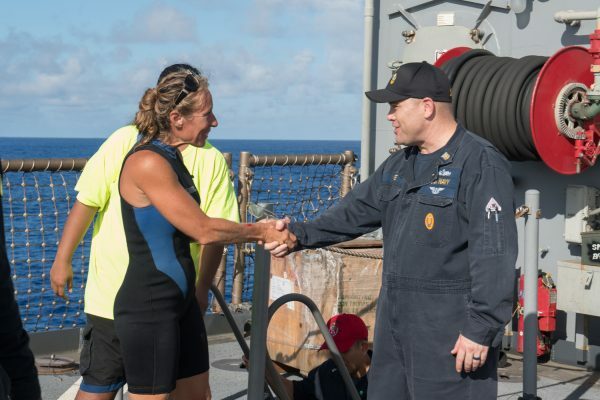 The pride and smiles we had when we saw [U.S. Navy] on the horizon was pure relief,” said Appel, according to a Navy press release. The Ashland crew checked out the women’s boat, determined it was unseaworthy, and brought them on board together with their dogs. They received food and medical attention.